Low Brass Ensemble Clinics are designed for Schools, Camps, Festivals, or Conferences. Using his unique teaching method, Performance Through Participation, Norlan Bewley clinics are typically single events and 3 hours in length. In the Low Brass Ensemble Rehearsal Clinic all the participants play in the ensemble. Low Brass Sectional Clinics can focus on individual or combined instruments (trombone, euphonium, and tuba) to prepare participants in District, All State, Camp, Festival, or Conference Honor Ensembles. 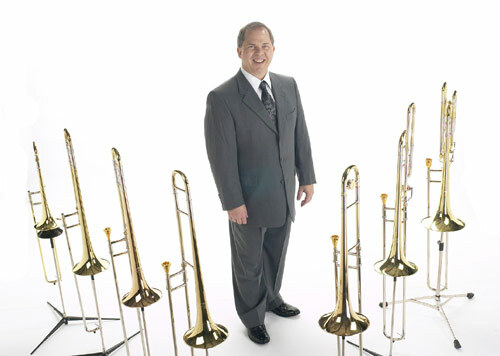 Norlan Bewley as a Guest Soloist on trombone, euphonium, and tuba with ensembles for conference appearances, etc. Available with or without a clinic. Music Role Playing: What's My Job Here? The Best Candidates for Low Brass "Switchovers"
Stage Fright: Are You Prepared?